In the spirit of my post about Christmas specials that pass (or fail) the Bechdel Test, I thought it’d be fun to look at animated Easter specials. It’s the Easter Beagle, Charlie Brown: One of the best of the animated TV Easter specials also passes this test easily. 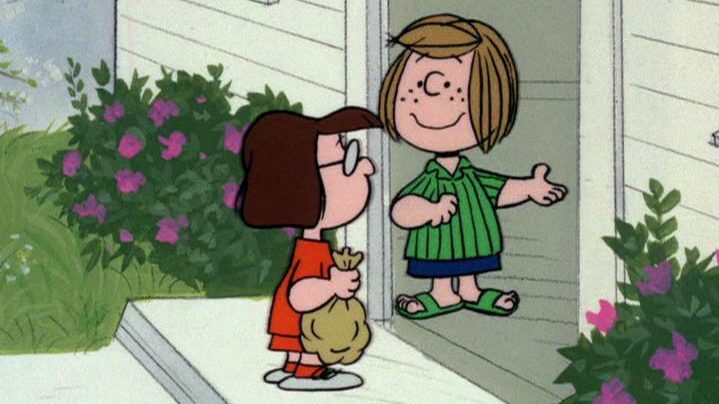 A key plot point is Peppermint Patty’s repeated failed-but-hilarious efforts to teach Marcie how to prepare Easter eggs. Bugs Bunny’s Easter Special: One of the various 70s and 80s Looney Tunes TV specials that consists of various shorts linked together by newly-produced footage to create a “story.” In this case, the special fails; while there’s a few female characters (Granny, Miss Prissy, etc. ), none of them talk to each other (given the nature of the shorts). Here Comes Peter Cottontail: While one of the great Rankin-Bass specials, this one fails. Some female characters get screen time (a wicked witch at Halloween; Bonnie the sentient Easter bonnet; a hat shop owner at Christmas; and Donna at Valentine’s Day). However, none of them talk to each other. The Easter Bunny Is Comin’ to Town: The few female characters (Lily Longtooth, several girls in Kidville) don’t talk to each other. Yogi the Easter Bear: I haven’t seen this 1994 special, which is the last traditionally animated appearance by Yogi. However, I assume it also fails, given the lack of women characters in Yogi’s already-small cast (Cindy Bear the only regularly-appearing one). The Wikipedia page shows there’s a few women in the special, so I may be wrong. Here Comes Peter Cottontail: The Movie: The confusingly-named direct-to-video sequel to “Here Comes Peter Cottontail” features several prominent female characters, including “Jackie Frost,” a relative of Jack Frost. However, since it’s been awhile since I’ve seen this special, I can’t recall if it passes or not. I love The Easter Beagle. I haven’t seen the uncertain ones, either. But I can tell you that those claymation ones were never charming to me, and I despise clip-shows. It passes the test, as there is a mother talking to her daughter early on. And more conversations. The story is based on Margery William’s beloved book The Velveteen Rabbit, one of the stories which moved me so deeply as a child. In the book, the little girl is a little boy, and the rabbit is written with the masculine pronoun, but often interpreted as a feminine personality in adaptations. The doll is thought of as being in love with the boy, and grows old and ‘shabby’ but their love is still there, (transcending puppy love and lust) and thus it is meaningful, eternal love and it has become ‘real’. The rabbit is a boy here, with the narrator being the elderly version recounting his life to you. But when the doll rabbit is turned into a real rabbit by the fairy at the end of the book, in this special, this is where a new story starts. The rabbit is given a mission by the fairy to become the first Easter Rabbit and witness the passion of Christ. And it’s 2D traditional hand-painted animation, my favorite!! !